This product was added to our database on Sunday 22 November 2015. 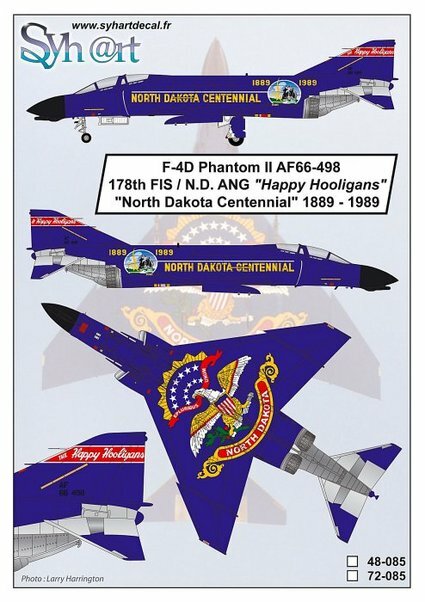 To commemorate the centennial of North Dakota 1n 1989, an F-4D Phantom from the famous 178FIS "Happy Hooligans" of North Dakota Air National Guard based at Fargo AFB, received a special scheme with colors of North Dakota flag, and the eagle applied very large below the aircraft. During the event the North Dakota governor flew on board this Phantom. Through the thousands of Phantoms flown during the decades, this F-4D is the only one receiving a special paintjob in U.S Air Force.